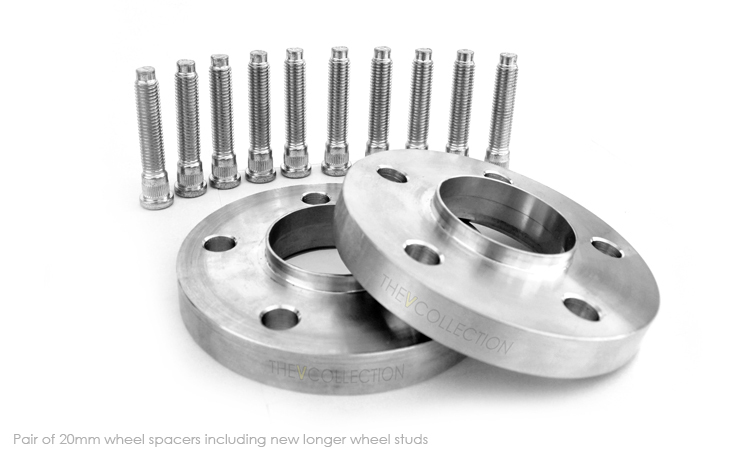 The V Collection wheel spacers have been developed to give the Aston Martin V8 Vantage a perfect stance. The spacers are placed between the hub and the wheel, thus positioning the wheel and tires further out so they are more flush with the fenders for a great look. The wheel spacers are hubcentric and feature a full contact hub, just like the factory hub for precise wheel alignment. The added benefit of a wider track is that you improve the cars performance by increasing grip during cornering. The spacer kits are available in 15mm or 20mm, and come complete with the necessary longer wheel studs. The longer wheel studs replace the existing wheel studs and require the new longer studs to be pressed into the hubs of the vehicle. The wheel spacers are sold as a pair.